Jamaica Bay, on the southern edge of Long Island, is getting a little rough around the edges. Changes in the salt marshes around the bay have left them more vulnerable to erosion. That could expose the land behind them to more flooding as sea level gets higher. And it could damage the habitat of hundreds of species of birds, fish, and other creatures that live in and around the bay. Researchers recently studied core samples from two marshes along the bay. The cores contained sediments deposited over the last 350 years. The scientists found markers in the sediments to help them establish when each layer was deposited. The amount of charcoal in the sediments went up in the 1800s, for example, as a result of the Industrial Revolution. And the amount of zinc went up in the early 1900s, as a wastewater plant began dumping treated sewage into the bay. 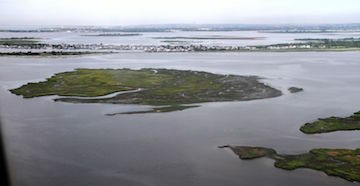 The cores showed that the amounts of dirt, sand, and other solid particles entering the marshes and the bay have dropped over the last century as a result of urban development. At the same time, the amount of organic sediment in the area -- material produced by living organisms -- has gone up. But that material isn’t as stable as the sand and dirt. That’s led to increased erosion of the marshlands. The marshes provide a buffer against tropical storms, so the erosion could intensify their damage. And the marsh sediments contain high levels of zinc and lead from earlier eras, which could pollute the water -- making Jamaica Bay even rougher.